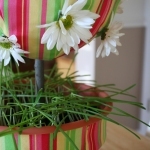 Crafting geniuses Chica and Jo share this project for creating a fabric and daisy topiary, perfect for Easter decorating. The project cleverly uses Styrofoam balls at the base for the topiary. Use as a table centerpiece or place in your entryway to greet guests. 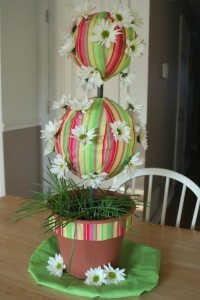 Get started on this project now to allow time for the grass to sprout in the pot! Short tree branches for "trunk"
Repeat this process for the 6″ ball. When both balls are covered, place them back on the sticks in your topiary. Now you’re ready to decorate them with flowers! The buttonholes in your fabric will give your flowers somewhere to enter the ball, but Styrofoam is a bit too firm for most flowers to go into without breaking. To make it easier to insert the flowers, start the hole by inserting the handle of a paint brush into the Styrofoam at each buttonhole, and make a nice space for the flower to go. Then trim each of your daisies so that the stem is about 2 inches long, and attach each one to a wired wood pick. Wrap the wire around the flower, holding it in place. The pick will keep your flowers straight and strong, and allow you to push them into the Styrofoam with ease. Put one flower into each one buttonhole. The finished topiary is adorable and would look great anywhere in the home. Fresh daisies will last a day or two, so if you’re doing this for a party, wait to assemble it until a few hours before guests are arriving for maximum freshness. For more Easter crafts from our favorite craft bloggers, see the Crafts for Easter: Blogger Edition 2009 eBook.